We featured a number of custom 09 Challengers in the April issue. There were a couple of killer examples screwed together by the factory. While the factory fryers arent available for sale to the public, a number of turnkey customs are, including special editions from the Hurst folks and Mr. Norm, through his Mr Norms Garage program. Here are some additional images of the Hurst and Mr. Norms Challengers. Hurst offers four special edition Challengers with the top-of-the-line Vortech supercharged 6.1 Hemi version shown here. Note the emblems, badging and logos that come with the package. Also, the pedal dress-up package and the stout Hurst shifter. Mr. Norms Garage currently offers two Super Challengers and a Super Cuda (which really is a Challenger with some Cuda-like bolt-ons. Norm will let you mix and match any of his special components (including the optional Kenne-Bell supercharger for up to 900 horsepower), so you can have one of these Challengers built to your own specs. 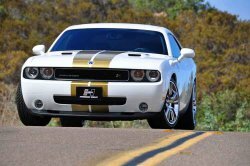 This Super Challenger pays homage to the original with its modern interpretation of the T/A stripe and hood. The front and rear spoilers are factory pieces that have been wrapped in carbon fiber and then sealed, adding a really cool look. Appealing more to the younger demographic, the Super Challenger carries a more modern, rather than a traditional, theme. The nose-to-tail stripe tends to give the car a lower, longer appearance, and the 22 rollers with big meats are right in tune with current trends. Note the bolt-on (faux) fender vents. This Challenger, as well as the Cuda below, pack some great brakes  Stainless Steel Brake Corp (SSBC) 8-piston calipers up front, with tripower calipers out back. Whoa, baby! Heres the Mr. Norms super Cuda version of the 09 Challenger. All the special components (including the grille) bolt on and off. The tail panel reinforces the Cuda theme. All Mr. Norms Garage Challengers have a signed plaque on the dash as well as the radiator yoke.